UPDATE, 12:50 a.m. Wednesday: Bethel musher Pete Kaiser flew through the checkpoint of Safety, 22 miles from Nome, shortly after midnight Wednesday about 40 minutes ahead of defending champion Joar Leifseth Ulsom of Norway. Kaiser reached Safety at 12:03 a.m. and left at 12:05 a.m., and is continuing to race with eight dogs on his team. Leifseth Ulsom and his eight-dog team arrived in Safety at 12:42 a.m. and left three minutes later. NOME — An Iditarod Trail Sled Dog Race that’s had no shortage of drama was heading to its conclusion Tuesday night as Pete Kaiser and Joar Leifseth Ulsom dueled for dominance in their sport. Kaiser, a 31-year-old from Bethel, left White Mountain 42 minutes ahead of defending champion Leifseth Ulsom, 32, late Tuesday afternoon. They had just completed their mandatory 8-hour rests and were 77 miles from the finish line in Nome. 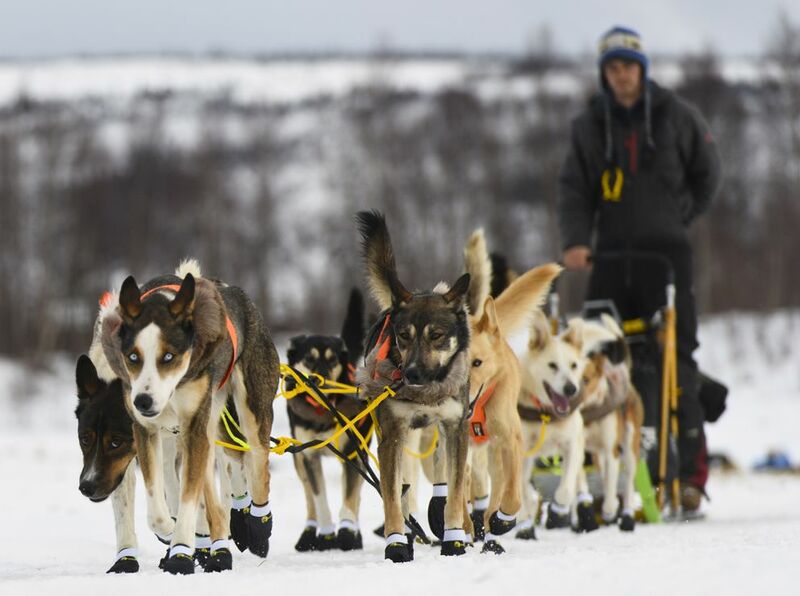 Both mushers had eight-dog teams and a snowy trail ahead. Kaiser is chasing his first Iditarod win and Leifseth Ulsom, from Norway, is after his second. Both men — calm and quiet mushers — have been consistent top performers year after year. Aside from each other, their closest competition Tuesday evening was Fairbanks musher Jessie Royer, who was roughly four hours behind them. 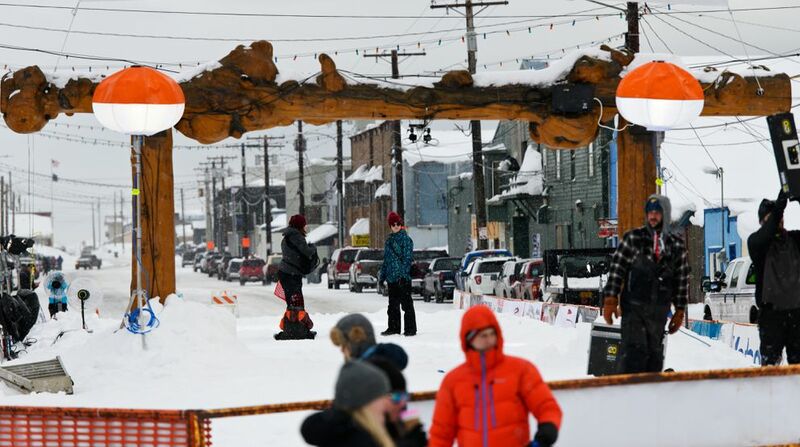 A champion is expected to reach Nome early Wednesday. The story of the this year’s Iditarod is one of warm weather, tough sections of trail and dramatic twists and turns. There were the punishing tussocks less than halfway into the race, the overflow on the Yukon River, and wind and drifting snow on the Bering Sea coast. There was also a last-minute shakeup that left the race with a new leader, just like last year. And just like in 2018, it involved Girdwood musher Nicolas Petit and the stretch of trail out of Shaktoolik, more than three-quarters of the way into the 1,000-mile race. Petit led for much of this year’s Iditarod and was the leader out of Shaktoolik on Sunday night. Then on the sea ice, his team refused to continue down the trail. Kaiser charged past a stopped Petit. So did Leifseth Ulsom and several other mushers on their way to Koyuk, the next checkpoint. Petit ended up calling it quits and dropped out of the race. When Kaiser seized the lead, his hometown of Bethel cheered in approval. His family has deep roots in the Southwest Alaska community. His Yup’ik great-grandmother was raised in an orphanage in Bethel, said Kaiser’s mom, Janet. His Scottish great-grandfather came to the country as a gold miner and eventually landed in Bethel. A Kaiser victory would be huge for Bethel and the region, Janet said. It’s a close, dog-mushing community. Kaiser made a decisive move early Tuesday morning in Elim. He reached that checkpoint, 875 miles into the race, 50 minutes before Leifseth Ulsom. “It was kind of funny, there was some awkward silence for a while, but (Leifseth Ulsom) finally said he was gonna go lay down," Kaiser later told the Iditarod Insider in White Mountain. Kaiser said he asked Leifseth Ulsom if he planned to take a long break or follow him out of Elim. Leifseth Ulsom said he’d follow him out. Leifseth Ulsom later told the Insider with a smile: “Just when I was like, ‘OK, I’m gonna go lay down,’ he’s like, ‘Well, I think I’m gonna head out.' So that was good." Both men were in race mode by then, and Kaiser knew leaving was the right move. When asked if he tried to talk Kaiser into staying longer in Elim, Leifseth Ulsom said he didn’t. “I don’t want to be trying to tell him what he should do,” he told Insider. “We’re competing hard and we’re buddies, whatever he’s going to do, he’s going to do anyway." Kaiser is a nine-time Iditarod finisher, placing at least 14th every time except his rookie run. His best finish is fifth and he’s done that three times, including last year. Kaiser is also a four-time champion of the Kuskokwim 300, a race that starts and ends in his hometown. Leifseth Ulsom has never placed worst than seventh in his previous six Iditarods. This year’s race was notable for a small race field and small dog teams. A new rule limited teams to 14 dogs, down from 16. Just 52 mushers started the race, the smallest number since 1989 when there were 49 teams. By Tuesday, 10 mushers had called it quits. Historically, 78.9 percent of Iditarod starters reach the finish line.